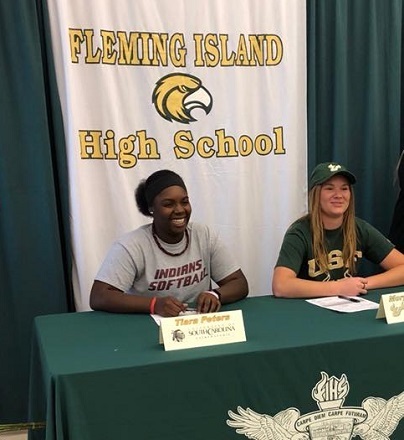 USC Salkehatchie softball signs- Tiara Peters from Fleming Island Florida- welcome to the USC Salkehatchie athletic family Tiara! FLEMING ISLAND – In one of the springiest days of the early softball season, the Fleming Island High softball team hammered away at a overmatched Robert E. Lee High team squad to the tune of 22-0 win on Wed., March 1 at Fleming Island High School. Fleming Island’s record moved 5-3 overall with a 1-0 loss to district 2-8A foe Fletcher High on Thurs., March 8. On Mon., March 12, Fleming Island battled but fell 4-2 to 7A-Bartram Trail, who recently beat Oakleaf 8-4 and sits atop of district 4-7A at 6-1. Against Lee, Fleming Island’s bats exploded for a 12-0 lead off two in-the-park homers; one from Maya Littles for two runs, one from Tiara Peters for three runs on her second at-bat of the inning. Madi Lanoux added her own in-the-park dinger in the second inning as Fleming Island ran to a 15-0 lead. The game was ended in the third inning. Against Fletcher, the Lady Senators scored first and also shut down the Fleming Island bats for the 1-0 win. Fletcher scored off a passed ball putting on a baserunner then a run scoring double off pitcher Morgan Kendrick. Neither team could generate more than four batters per inning for the rest of the game. Kendrick finished with nine strikeouts. Fletcher is now 3-1 in district play; 3-4 overall. Fleming Island is 5-3, 1-2 in district play. Oakleaf leads the district at 8-1, 3-0.